Yet another "Out Of Town" Post... I'm not a big fan of the beach. Maybe it's because I practically grew up on one when I was living in Cebu. We practically spent every weekend there. So in all honesty, going to the beach is no big deal to me. And I'm someone who can't stand the feeling of heat. I really need air conditioning. I joke around that one of my super powers is "Invulnerability To Cold". I sleep practically naked and i need to have all the air of the aircon blasting away at me. (Ok, i'm sure that's a mental picture you didn't want, and you've lost you're appetite.. Given the fact that this is a "food post" i'm going to change the subject) Not being stuck up or anything like that, but I really enjoy cold weather. So predictably, one of my favorite places to go in the Philippines would definitely have to be the City of Baguio. 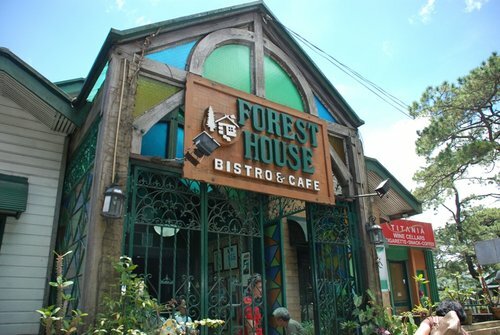 Discovering Forest House Bistro & Cafe only reaffirmed it for me. Baguio may be the coldest spot here in the country, but it's still not cold enough for me. Nevertheless, I love the clean air, and the slightly colder atmosphere. Baguio has gotten so much more crowded and modernized in the past years, but it still has that old city feel that makes me feel like a kid again. 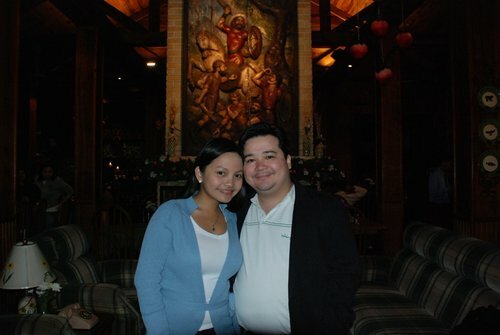 When we went to Baguio with our parents in August of 2009, I promised my wife that I would take her out to a romantic dinner, every night we were there. 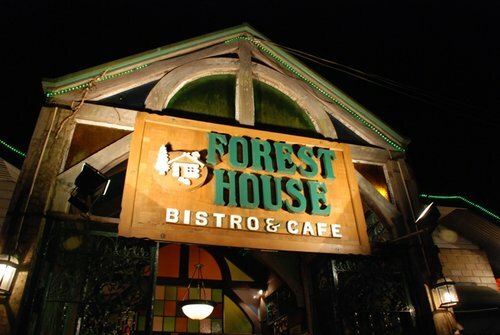 I had asked around in my facebook account for suggestions for a place that I could take Rina, and Forest House was the name that came up alot. I had never heard of this place before, but since it seemed to be quite popular, I decided to give it a shot. And I'm so glad that I did! I initially went there with Rina and my parents for lunch, but we were unlucky enough to get there on a day where they were closed for lunch, due to a function. They were gracious enough to let us take a look around while they set up for their event, and they took down our reservations for just Rina & I later that night. The place is really fantastic. I mean, if you like that country home feel that I do, you're really going to love this. All you need is a lit fire place and you'd feel like you're in an American Christmas Movie special. 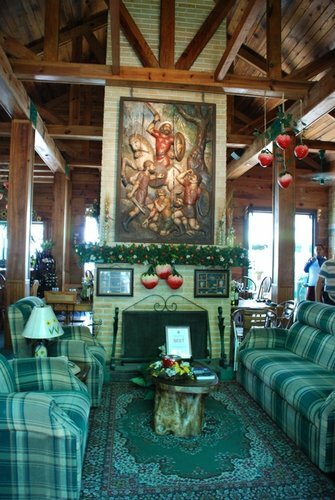 I think Decor-wise though, they kinda go over the top, with so much stuff hanging from the walls that you can barely see the bricks, but nevertheless It still has a nice comfortable feel to it. It's a good thing we left our house in Baguio a little bit earlier than supposed to. We were told it would be a 15 minute drive, but we left 30 minutes earlier because we were expecting our driver Joel to to not remember how to get there. I don't blame im though, because I couldn't remember it either, and I'm kinda proud of my ability to remember directions. I guess it's a whole new ball game when it's at night and in Baguio, where the roads can be so winding and confusing. Luckily, we got there promptly at 7:30 P.M., at were immediately led to our table for two. An acoustic band was playing, and I regretfully forgot their name, but they were damn good. The lead singer got "Better Days" down pat, and the dude did a nice rendition of "Keep This Love Alive". With those songs playing, you can imagine that the atmosphere of the place was light and relaxed. But if I wanted music, i would've turned on the radio. I wanted my food. We took a look at the menu, and were pleasantly (Me a lot more than just "pleasantly") surprised with the prices of their dishes. All were very reasonable - considering the ambiance of the place, I was for some reason expecting it to be almost P400 to P500 per dish, but i was wrong. 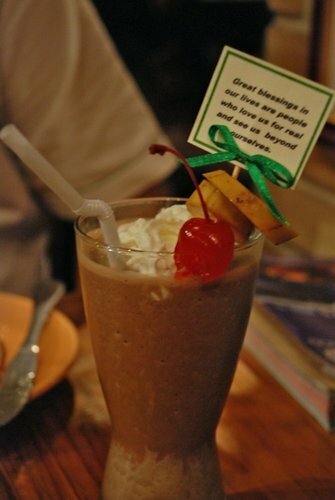 I ordered a Frozen Choco-Banana Shake, whats it to you? Despite the cold weather, Rina and I decided to order shakes - Me going with the Chocolate Banana, and she, since we were in Baguio, decided to try their strawberry shake. The Choco-Bana Shake was nice and creamy, but they could've blended it a bit more so there'd be no more ice chunks, but it was still a nice refreshing shake. Rina seemed to enjoy her strawberry shake. I didn't want to try it - mainly because we were out of town and were going to be going on an 8 hour road trip in a few days - I didn't want to risk eating or drinking something that would throw my tummy out of whack. 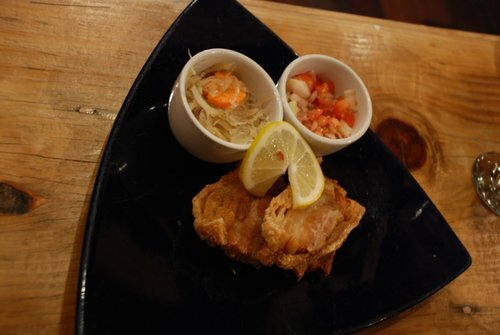 When you're up North, you've got to eat Bagnet. You've GOT to. 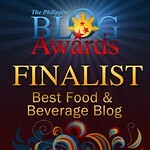 We made the most of our time there by trying "Forest House's Homemade Bagnet" (P170) and was not disappointed. The dish was a meal in itself, making me wonder why they had it as an appetizer.. or as it says in the menu, an "Appeteaser" (Funny. Not.). From the moment they plopped it down on our table, it smelled so good, I had to take a bite. Sadly, it was in that moment when I took my first bite that I realized something - Rina was in the restroom when it arrived so she didn't have a chance to take a picture of it yet! Touching the dish before she could take a picture is a mortal sin to her, so she wasn't happy to see an incomplete dish before she had a chance to get her camera out, and my stuffed mouth was a dead giveaway (she's a regular Sherlock Holmes, I tell ya). 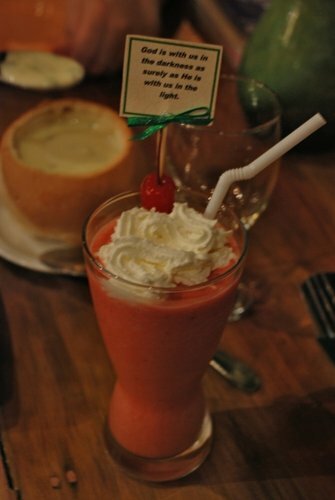 It came with atchara and ensaladang kamatis (or at least that's what I think it was), but again, I didn't try either. The meat was really crispy without being too dry and hard. If you're a fat lover, you're gonna like this, although there is a great deal of meat on it as well. 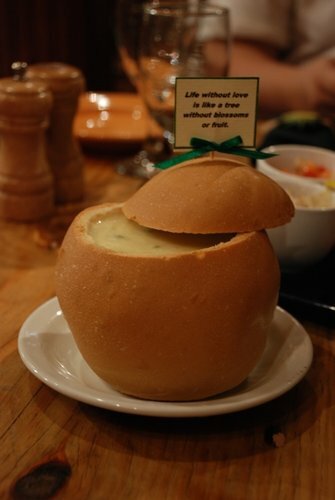 Bread Bowl Soups! Me Likey! Rina & I shared the Potato Cheese Chowder (P90!!) and were very disappointed. Not disappointed with the taste, but disappointed we shared and didn't get one each instead. I love potatoes, and I love cheese, so when you mix them together into a bread bowl like that, magic happens! The bread was soft and moist, but still held together well all throughout the existence of soup inside it (which wasn't very long, to be honest). When we go out to eat and it's available, there's a good chance that Rina will order the Salpicao. 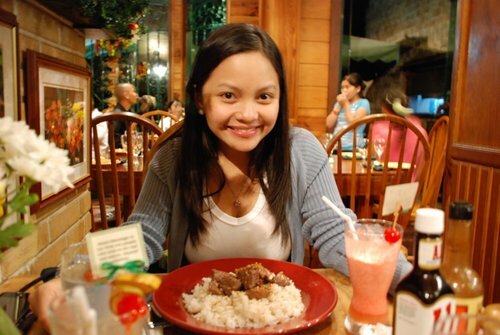 She really likes salty food, and Salpicao usually fills that craving she gets. Forest House was no exception. 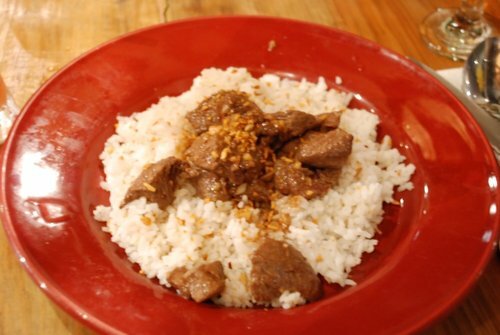 She got the Australian Grain Fed Salpicado (P395) and was amazed with how soft the meat was. The garlic wasn't too overpowering and the bed of garlic rice was the perfect complement to the meal. I usually do find Salpicao a bit too salty for my taste, but this one was better than most. 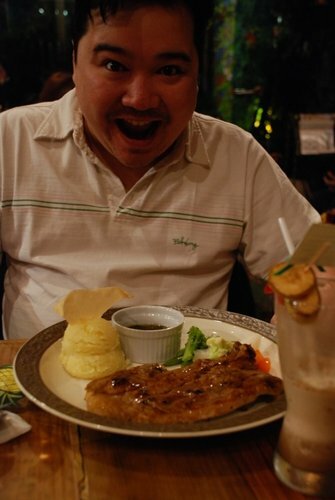 The smile of a happy, (albeit hungry) man. Why do birds suddenly appear every time you are near? I'm a sucker for dishes that carries the name of the restaurant on it. There's an air of comfort when you see it, because a restaurant wouldn't dare put their name on something that sucked, right? Not to mention that lamb chops are one of my most favorite things in the whole wide world.. so it only made sense that I order their The Forest House Lamb (P370).. and it was fantastic. 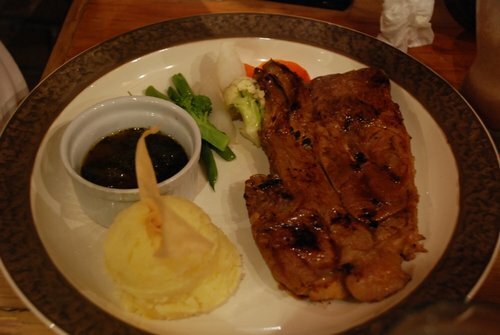 It was marinated in mustard so it has a tangy taste to it, but the Japanese soy sauce melds the flavor perfectly. When dipped in the mint sauce, the flavor of the lamb just explodes in your mouth. The only bad comment I can think of, is that I found the Mashed Potatoes a little bit dry, but it was nothing a healthy helping of gravy couldn't fix. Unfortunately, it didn't come with any, which i feel is a slap across the face to potato lovers everywhere. 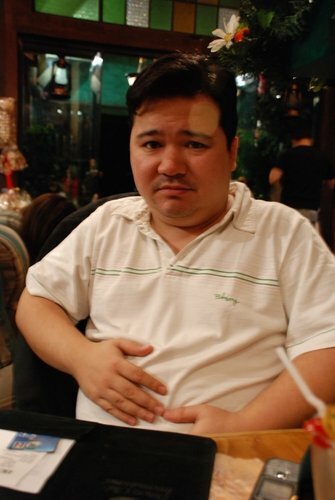 I was so stuffed, I had to undo one notch of my belt buckle..
After the meal, Rina & I were so full, we decided not to have dessert anymore. Besides, we got our sugar fix from the shakes already, and we had a huge lunch at Baguio's legendary Star Cafe earlier that day, so we had to resist the urge to over-stuff ourselves. Beautiful weather, wonderful wife, fantastic dinner.. yes, it was a perfect night, indeed..